In the era of Central Bank policy influence, we have become used to large shifts in the performance and trends of different currencies across time. 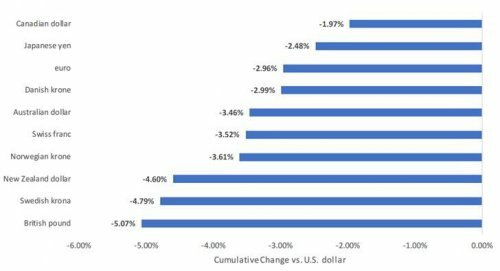 For the better part of the past two years, the currency headlines have been dominated by a weakening US Dollar. A very nice tailwind to the earnings of large cap, multinational US stocks—particularly those with a lot of exports. A strong commodity rally—remember when we were speculating if a barrel of oil would go below $20 in February of 2016? Those thoughts have since receded. Strong performance out of emerging markets, where currency appreciation versus the dollar plus positive equity performance has worked together to create a stronger return backdrop for US dollar investors. Are we seeing a shift toward a strengthening US Dollar? Currencies rarely move in a single direction for an extended period—especially in today’s world. Therefore, we believe in being particularly attentive to anything that may signal a change in trend, as the ideal playbook for a weak US Dollar environment is not the same as the ideal playbook for a strong US Dollar environment. Source: Bloomberg. Dollar is shown by the Bloomberg Dollar Index. Past performance is not indicative of future results. You cannot invest directly in an Index. 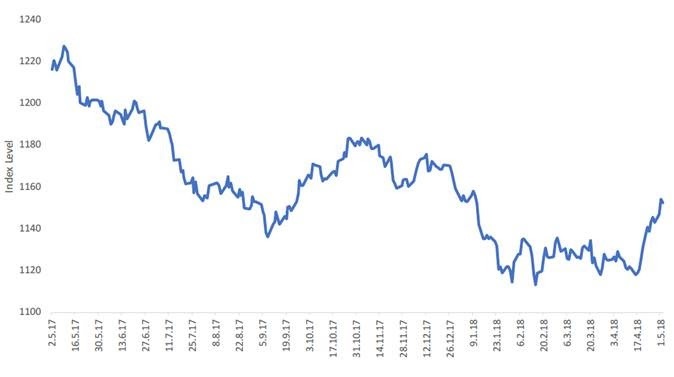 As we can see in the chart, over the last year, from 2 May 2017 to 1 May 2018, the Bloomberg Dollar Index declined about 5.1%. However, from 16 April 2018 to 1 May 2018, the dollar has rallied 3.23%, the steepest dollar rally investors have seen in the past year. My colleague Jeremy Schwartz wrote about a return to a King Dollar policy environment with the appointment of Larry Kudlow to the Trump Administration as an economic adviser. At the very least, the dollar focused rhetoric from the White House economic team has taken a more supporting tone. At the start of 2017, many market prognosticators would start discussions with their outlook on the Fed, expecting 2-3 interest rate hikes over the course of the year. Frequently, they would connect rising interest rates in the US, stable or even falling interest rates abroad and a stronger US dollar. While a good story, markets didn’t quite play out in that way during 2017. Source: Bloomberg. Past performance is not indicative of future results. You cannot invest directly in an Index. While interest rate differentials—the force of capital flowing towards higher interest rate(and therefore higher return) markets—does have an impact on currency returns, it is not the only impact. Other factors such as capital flows that create their own price momentum, purchasing power parity, and the perception of geopolitics can play a role. Since the end of 2015, it has been fairly rare to see broad-based dollar strength against all of the G10 currencies—and we have seen it over the past few weeks. It is not accidental that the US 10-year treasury breaking through the 3% level for the first time in about four years has corresponded with a shift in the US dollar. It could be very interesting to see what the impact on the dollar can be if the 10-year interest rate breaks through 3.05%. We have seen how strong US large cap stocks have been during this period of dollar weakness just experienced. If we enter a stronger US dollar trend, it’s important to note that large cap US equities—particularly multinationals—would see a headwind to their earnings. Non-US exporters selling into the US market—which remains the largest consumer market in the world—become very interesting during periods of dollar strength. We have heard many discussions relating to how a rising US interest rate environment could cause a headwind to the high valuation multiples that investors in US equities have become used to. It is important to remember—multiples are not at history highs globally, and if the dollar shifts in its trend, it may make foreign markets even more attractive, so long as one hedges their currency risk. Export oriented companies in the Eurozone, Germany and Japan do see boosts to their earnings to varying degrees when their currencies weaken against the US dollar—just like US large caps have benefited from dollar weakness of late. Many of these companies do a lot of business with the US. Investors often get timing of currencies wrong. 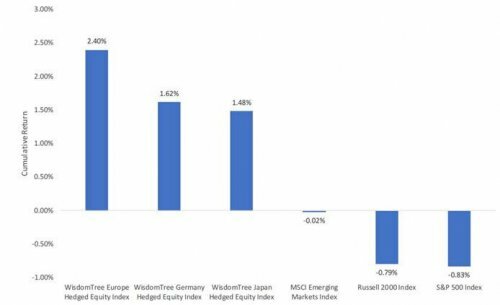 WisdomTree is a strong believer that hedging helps neutralize currency movements and should be used strategically in portfolio allocations. The recent firmness of the dollar- and our more positive expectation for this to continue over the next 12 months—should give extra timing impetus to make these portfolio transitions sooner than later.